A new tool to examine the economics of lock-up decisions has been developed and tested. Dual-purpose crops hold great potential to utilise early-season sowing opportunities to provide extra grazing for livestock and maintain grain yield. With good management, the period of grazing can increase net crop returns by up to $600/ha (i.e. 2,000 sheep grazing days at 28c/day) and can have a range of system benefits including widening sowing windows, reducing crop height, filling critical feed gaps and spelling pastures. Over ten years of experiments, simulation studies and collaborative on-farm validation across Australia have demonstrated that a wide range of cereal and canola varieties can be successfully grazed and recover to produce combined livestock and crop gross margins that exceed grain-only crops, and increase whole-farm profitability (Table 1). Table 1: Typical examples of forage, grain yield and gross margins achieved from well-managed dual-purpose crops by collaborating growers in southern New South Wales (NSW). Here we provide brief explanations of how grazed crops are able to recover, some best-bet tips on increasing the success and profitability with dual-purpose crops, and give some case studies of what we have achieved experimentally and with collaborating growers. How can I graze crops and still achieve the same yield? The yield potential of any grain crop is related to the biomass at anthesis to support grain-filling. The yield achieved then depends on conditions during flowering and grain fill to realise the potential. In Australia, because crops grow the biomass from autumn to early spring, but flower and fill grain as things are becoming hot and dry, they almost always grow more biomass than will be needed for the grain yield that can be achieved. A rule of thumb is that each 1t/ha of wheat grain yield needs 1.8t/ha of biomass at flowering (i.e. 3t/ha crop needs 5.4t/ha of biomass at flowering, etc). Well-managed, early-sown crops in medium and high rainfall areas often produce significantly more biomass at flowering than is needed for the likely grain yield. This explains why we can use some of this excess biomass with careful and timely grazing, and still achieve the target yield. The ’safe’ grazing period for cereal and canola crops is from the time the crop is well anchored, until the reproductive parts start to elongate above the ground and can be damaged or removed by the livestock (DC30 for cereals and bud elongation for canola). Any crop can be grazed in this window and grazing will usually delay flowering from a few days to two weeks depending on grazing duration. Early-sown, slower-maturing crops have the longest vegetative period and provide the most grazing potential, but typical grain-only spring crop varieties can also be sown early, and provide useful grazing without significant yield loss following the same principles – but the potential grazing is much reduced (Figure 1), and closer management of lock-up timing is required. **Each week delay in sowing wheat after early March reduces grazing potential by 200-250 DSE.days/ha and yield by 0.45t/ha. Though different strategies and crop types are better suited to different regions due to the rainfall and season length, a mix of the different approaches shown in Figure 1 can be used on the same farm to take advantage of early sowing opportunities in specific seasons to increase and widen the overall operational and crop grazing window. 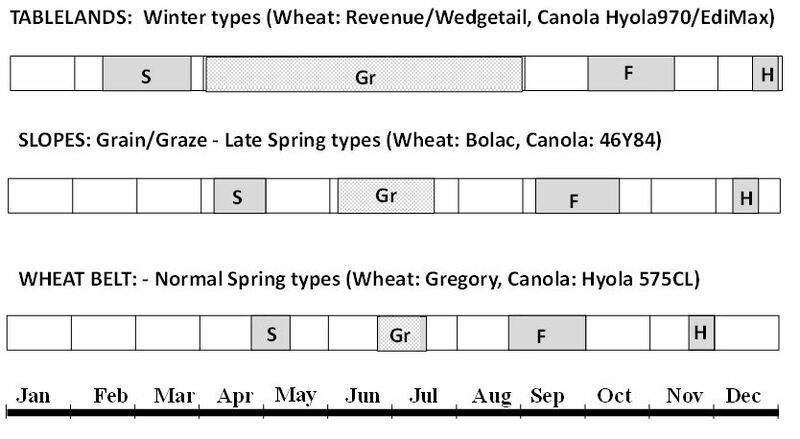 Figure 1: Increased grazing window of early-sown, longer-season winter varieties in longer-season Tablelands areas compared to spring types in the cropping zones (typical windows shown are S=Sow, Gr=graze, F=flowering, H=harvest). The ultimate goal for managing dual-purpose crops is to maximise profit from the combined income of both the grazed forage and the grain. This requires an understanding of how grain yield is affected by heavier or delayed grazing. Our studies have demonstrated that the time of lock-up and the residual biomass are the critical issues. We can define the overall grazing window into ’safe’, ’sensitive’ and ’unsafe’ periods related to the impact on grain yield (Figure 2). The early and “safe” grazing period is once the crop is well anchored and there is still plenty of time for recovery after a period of grazing, even if the crop is grazed quite heavily. The late and ’unsafe’ period is when the reproductive parts of the crop (spikes in wheat or buds in canola) are elongating above the ground, and can be removed by stock, and there is also too little time for the crop to recover enough biomass by anthesis to set a reasonable yield potential. Most growers can easily identify these two periods by testing crop anchorage to start grazing, and checking crop development stage to stop grazing. The ’sensitive’ period is the period in which the crop has not yet begun to elongate, but where yield recovery can be very sensitive to the amount of residual biomass left. This is the period where some idea of how much residual biomass is needed to reach a specified target grain yield can assist growers with lock-up decisions to avoid yield loss while maximising grazing potential. Figure 2: Yield recovery (% of un-grazed crop) of grazed dual-purpose crops highlighting the safe, sensitive and unsafe periods of grazing. Yield recovery from grazing during the sensitive period for a given target yield is affected by the residual biomass at lock-up. Late grazing reduces the time for recovery, so more residual biomass is needed. We have used a range of different winter and spring wheat and canola crops in the studies. An example is that a typical grazing EGA Wedgetail wheat crop sown on 25 March with a target yield of 4.5t/ha would require a critical anthesis biomass of around 8t/ha to 9t/ha (Figure 3A). This critical biomass would require at least 0.5t/ha of residual biomass to be left in late July (Figure 3B), when the crop becomes unsafe to graze without removing elongating heads (i.e. heads removed if past Z30). Grazing past this point would require close attention to grazing height to ensure heads were not being removed, and more residual biomass (1.0-1.5t/ha) would be needed to be left at lock-up in mid-August to still achieve the same critical anthesis biomass, because there is less time left to reach the biomass for the target yield. Note that the spring wheat EGA Gregory sown on 8 May generally had similar critical and residual biomass levels to attain similar yields. Figure 3: (A) Shows that for a 4.4t/ha target yield in wheat, around 8.0t/ha to 9.0t/ha was required at anthesis, and treatments with less than this had reduced yield. (B) Shows that residual biomass after grazing of >0.5t/ha in late July was sufficient to reach the critical anthesis biomass for 4.4t/ha yield. For canola the residual biomass requirement left after grazing is higher than wheat, due to the inherently heavy and thick stem bases and slower regrowth after grazing. Spring canola requires about 1.5t/ha of residual biomass left when locked up at the end of July (when the stems begin to elongate) to ensure 2.5t/ha to 3.0t/ha yield potential. Earlier-sown winter canola has even thicker stem bases, and requires around 2.5t/ha of residual biomass for recovery. Ultimately, economics (feed value vs grain value) in the farm enterprise dictate the acceptable level of grain yield loss (if any) for dual-purpose crops. In many cases, especially where the feed is being used to fatten or finish lambs or cattle, it is possible that accepting a grain yield penalty makes the most economic sense, as shown for the moderately grazed crop shaded in Table 2. Table 2: Amount of grazing achieved and grain yield from different grazing treatments in an EGA Wedgetail crop at Greenethorpe in 2013. Income was highest with a small grain yield penalty as the extra grazing was more profitable than yield lost. Spring wheats such as EGA Gregory can also be grazed with success, but due to the later optimum sowing dates and smaller safe grazing window (Figure 1), the amount of grazing achieved is much less (Table 3). The effect of grazing too late and/or leaving too little residual biomass (<0.5t/ha) can be seen to impact on the economic outcome. In this case with spring wheat, yield was only maintained with later grazing if a large amount of residual biomass remained, and this did not match the economics of grazing hard earlier to provide time for recovery. 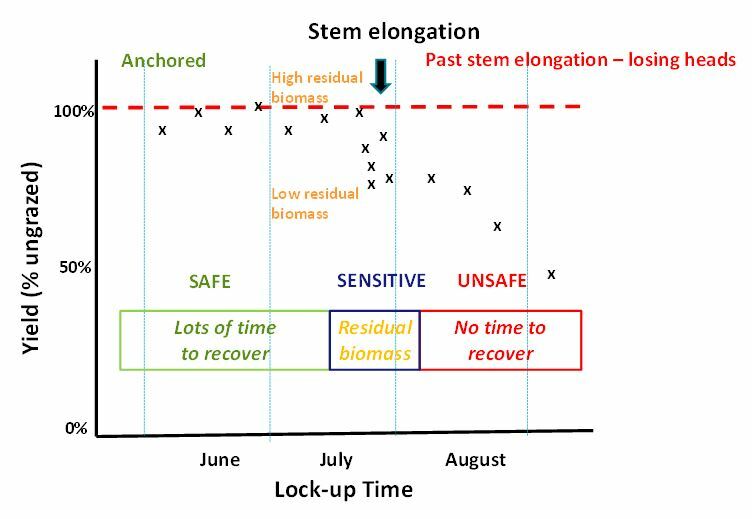 In general, a much greater level of attention is needed to manage the timing of lock-up in spring crops as development is rapid and the plants less robust. But grazed spring wheat and canola crops can widen the crop-grazing window at the farm-scale. Table 3: Amount of grazing achieved, grain yield and additional income from different grazing treatments in an EGA Gregory wheat crop at Greenethorpe in 2014. The best outcome was to graze safely with economic penalties for later or harder grazing. In a review of 134 different grazing wheat experiments we found <10 per cent returned less than grain only, the median increase in net returns from grazing was 25 per cent and in one third of cases, net returns increased by 75 per cent or more. In the 87 canola grazing experiments, returns were somewhat less (median 17%) due to less grazing, and higher grain-value and so increased economic risks from yield reductions. To date, advice on grazing and lock-up management has mostly revolved around crop phenology rules, or calendar dates that come from trial and error over many years. The significant impacts on yield from the removal of reproductive parts by late-grazing are well known, so to maximise grain yield growers are advised to remove stock before DC30 for cereals and bud elongation in canola. 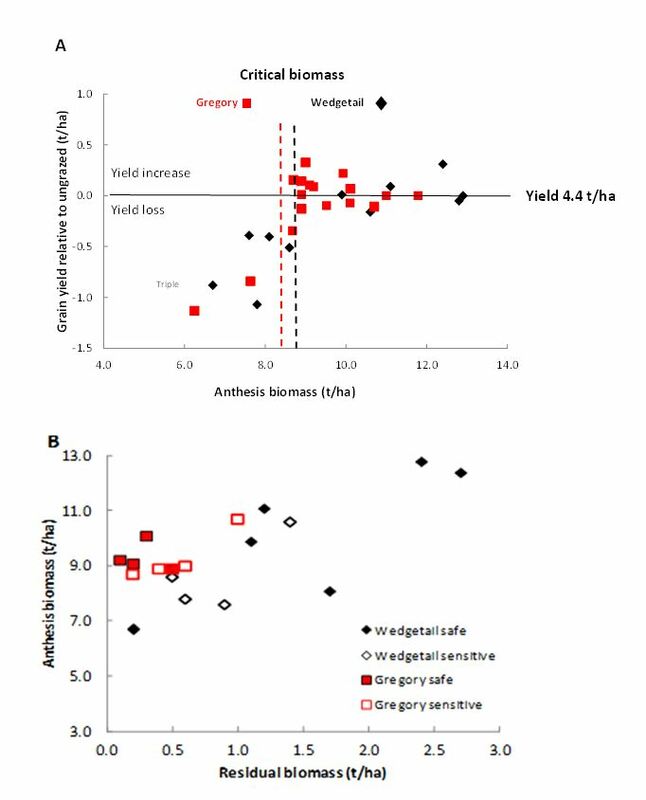 Our work has demonstrated that the risk of a yield ’penalty’ associated with grazing is likely to increase as the yield potential increases. A 5t/ha crop requires a higher level of biomass at anthesis than a 3t/ha crop, and therefore either an earlier lock-up, or more residual biomass at lock-up is required to reach the higher target. As a result, decisions to continue grazing at the possible expense of grain yield are dependent on the level of yield that has been targeted (Table 4). Table 4: Indicative biomass requirements on different lock-up dates to reach different yield targets in wheat. As the target yield increases from 3t/ha to-5t/ha, it is necessary to either lock-up earlier or leave more residual biomass to achieve the critical anthesis biomass required. The capacity for re-growth to achieve different biomass targets varies with the soils and climate of different areas and will vary from season to season. Decisions about lock-up times and trade-offs between grazing and grain will be specific to seasonal prices and grazing enterprises. Our grazing tool is designed to allow the user to set the yield target, and investigate the consequences of different lock-up decisions based on relative prices achieved for grain and livestock. A well-chosen dual-purpose crop should flower in a suitable window – even if not grazed. This maximises yield potential for the crops whether they are grazed or not, and provides peace-of-mind if circumstances change making grazing impossible or unwise. Likewise, where seasonal conditions deteriorate and crop recovery after grazing is poor, the crops can be cut for hay, silage or grazed out as sacrifice crops. In this way, dual-purpose crops provide an excellent risk-management tool on mixed farms with several ’exit points’ as seasonal conditions and prices change. On a typical 1,500ha cropping program, the inclusion of around 500ha of dual-purpose crops might create an extra 2-3 DSE/ha of winter stocking that can be considered as available. Growers can utilise this as feed by increasing the stocking rate, or maintain livestock at the same farm level, but take the opportunity to winter-clean areas of pastures. Dual-purpose crops can also be introduced onto graze-only farms to assist in rejuvenating areas of perennial pastures, and to generate income to control difficult weeds, with an excellent opportunity to re-establish clean pastures after a period of cropping. The opportunities are significant, but the crop and livestock management requirements to capitalise on dual-purpose crops are considerable. Successful early establishment, weed control and withholding requirements, stock planning, management and logistics are not trivial to optimise the whole-farm benefits of the extra winter forage. What is your livestock plan to make money from the extra winter feed? Weed control, withholding periods, stubble management, stored water for early-sown crops. Winter wheats in March, long-season springs wheats in mid-April, spring wheat late-April. Winter canola types in March, spring hybrid types from mid-April. Select vigorous canola varieties (hybrids) with good blackleg resistance (>R-MB). Seed dressings are affordable and effective, but follow-up aphid sprays in warm autumns may be required if aphids persist due to Barley Yellow Dwarf virus. 150 plants/m2 for wheat; 40 plants/m2 for canola. 100-150kg/N for winter wheats and canola; 50-100kg/ha for spring wheats and canola. Twist and pull test – usually need at least 1.5t/ha biomass (6-8 leaf stage in canola). Recovery and winter growth of canola slower than cereals. Graze canola once for longer as animals take some time to adjust (at least two weeks grazing). Stocking rates around 1,000kg/ha live-weight work well, but adjust to feed on offer. Animals take time to adjust to feed and do best if grazed for longer – avoid frequent change. Remove stock before DC30 in wheat and bud elongation in canola. If grazing later, ensure grazing does not remove reproductive parts. Assume wheat needs to see 40kg N/ha for every 1t/ha of yield and canola 80kg N/ha - and adjust topdressing according to existing N and target yield. The research undertaken as part of this project is made possible by the significant contributions of growers through both trial cooperation and the support of the GRDC. The authors would like to thank Rod Kershaw, ’Iandra’, for the use of land in 2013 and 2014 and Peter Hamblin and staff at Kalyx Australia (Young) for management of the field experiments at Greenethorpe.